Heat oven to 375°F. Spray bottom and sides of 13x9-inch pan with cooking spray. In large bowl, mix Cookie Base ingredients using pastry blender or fork until well combined. Press in bottom of pan. In medium bowl, toss Filling ingredients. Spread on base. In medium bowl, mix brown sugar, oats, flour and salt. Cut in cold butter, using pastry blender or fork, until mixture is crumbly. Sprinkle evenly over filling. Bake 30 to 35 minutes or until topping is golden brown and apples are tender when poked with tip of sharp knife. Cool completely on cooling rack, about 2 hours. Cut into 5 rows by 3 rows. Granny Smith apples hold their shape well when baked, which makes them perfect for this cookie bar. 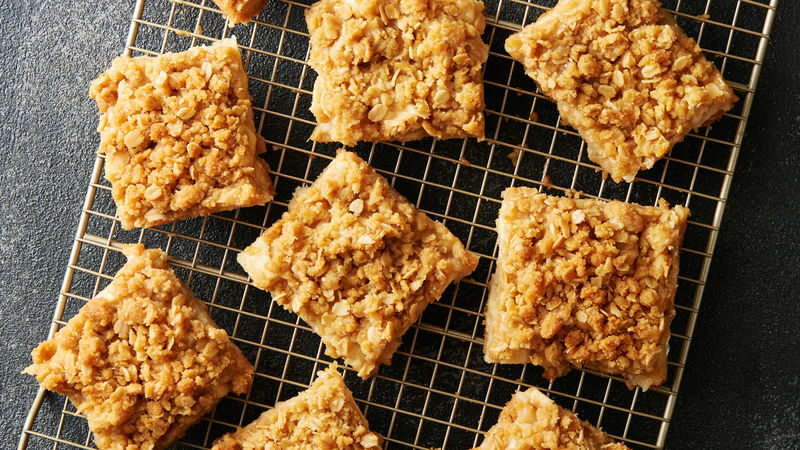 To make these delicious bars even more special, serve on plates with vanilla ice cream.